Get high-quality energy efficient casement window replacement in Chicagoland from the experts at Green T Windows. 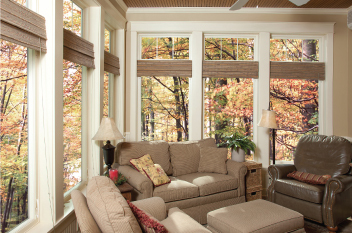 Casement Windows are the newest way to modernize your home’s personality. They add a contemporary look to any room with their folding, sleek hardware. Effortless operation and smooth gliding hardware make this deluxe window model into a true high-performance product. Casement windows are available in a variety of styles including bays, bows, twin, and triple configurations. Casements are easy to clean from inside your home. Extruded screen frame with small tabs to hold the screen securely in place. Optional between-the-glass blinds or blind panel inserts. Casement window with optional center bar gives the look of a double hung.